It's been a fantastic week here at House of Nines Design. 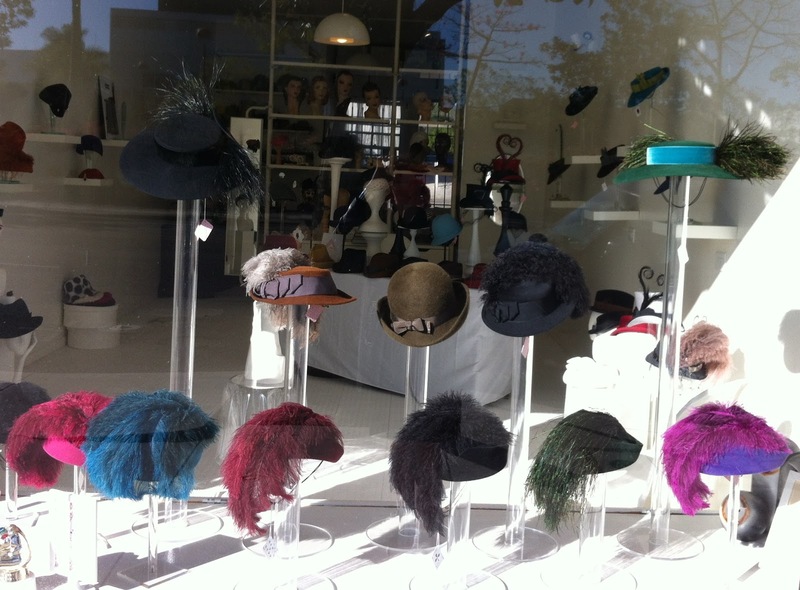 Last weekend, I went down to Southern California for a trunk show at The Millinery Guild in Los Angeles. I'm so glad to have had the chance to meet a bunch of nice new people, and to get to know the owner of the shop, Susan 'Monty' Montez. For more about the store and some great shots of the interior, see this previous post. I took about two dozen hats down with me, including some brand new and one-of-a-kind items, and filled up most of the showroom area of the shop. Here's a photo of the front window- in the back row of the window display at far left and far right, you can see my new picture hat, 'Talia', in black, and in hunter green with natural peacock hurl feathers. Down in the front row there are three new colors in the 'Maxima': hot pink, hunter green with peacock feathers, and purple with magenta feathers. Here are some of the displays inside the store. 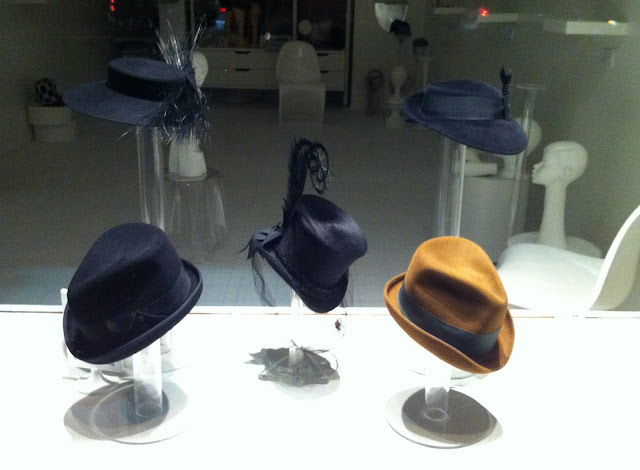 The new 'Drake' fedoras and the mini top hats were especially popular. We even had an LA-style celebrity moment, when actor Lance Gross stopped in. He was super nice and seriously extra handsome, and looked great in this 'Blake' fedora. After the show, Monty chose two 'Drakes', an 'Una', a 'Bergman' and a 'Talia' to keep in the shop, and I'll be sending her several more styles soon. 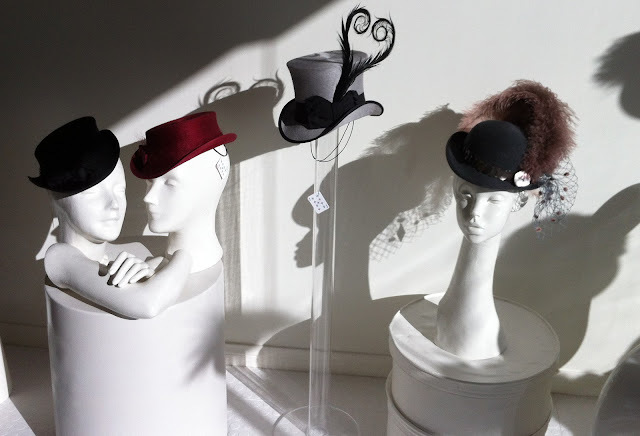 So, if you missed the sale, you can still stop by The Millinery Guild to see my hats in person. Thanks to everybody who made it out to the show! And thanks so much to Monty for being such an excellent and welcoming host to me and all the customers and friends who stopped in. 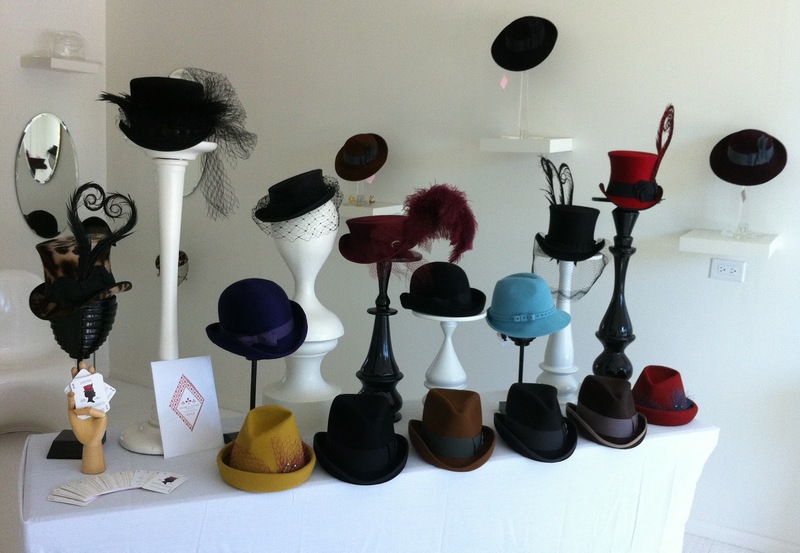 Be sure to check out The Millinery Guild's blog and facebook for announcements about other events, she'll be having a trunk show with different milliners almost every weekend through the holiday season- not to be missed! This weekend is Cristina de Prada, wish I could be there, love her work. After a great weekend in LA, I next headed down to the San Diego area, to meet with Jill Courtemanche, who has recently opened her own millinery store and workshop in Solana Beach. It's such a beautiful space. Jill chose three of the hats I had with me for the store, and ordered another nine to make an even dozen. She'll be carrying a variety of my mens' and womens' hats. I'll let you know once she's received the full order, and will write another post with more info and photos of this great new millinery shop soon. In other news, I've hired superstar Jason Galloway to work for House of Nines part-time to help with a lot of social media stuff, building a new website, and other cool things like that. His first day was yesterday. So, pretty soon we'll have Pinterest and Instagram accounts up and running, and a website with an integrated online store. Stay tuned.